Corytoplectus are erect terrestrial plants, mainly growing in cloud forests at high elevations. They are closely allied to Alloplectus, and have at times been considered to belong to that genus. The type species of the genus, Corytoplectus capitatus, was originally known as Alloplectus capitatus. In 1973, Wiehler reinstituted the genus, recognizing seven species at that time. By 1995, Wiehler had published two additional species for a total of nine. In 2008, Rodriguez-Flores and Skog described two more species bringing the total of recognized species to eleven. Corytoplectus differs from Alloplectus in having an erect umbellate inflorescence and fruits that are berries. The ripe fruits are shiny translucent spheres through which the dark seeds are clearly visible. Corytoplectus plants grow at higher elevations of the Western Cordillera of South and Central America (Bolivia to Panama and coastal Venezuela), and in the Guyana Highlands. A total of twelve species are presently recognized including a recently described one (Ramirez-Roa et al, 2009) from Mexico. The most commonly cultivated species are Corytoplectus cutucuensis, Corytoplectus speciosus, and Corytoplectus capitatus. 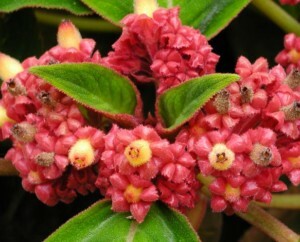 The plants of this genus are interesting horticultural subjects because of the unusual flower clusters, colorful calyces, attractive berries, and decorative leaves, many of which have dark green upper surfaces and pale veins. The plants require increased levels of humidity to grow and bloom well.